Pop, Splash and Chug. The Arashi Cover Pop travels with minimal forward movement to maximize the time your lure spends in the strike zone. Emulates prey struggling on the water's surface. Ideal lure for target fishing. Work close to laydowns, docks, rocks and anywhere else bass would hold on. Aerodynamic shape and extra tail-weight provide increased casting distance and accuracy and allows the lure to enter the water tail first with minimal splash and sound. Rotated Hook Hangers nest the hooks close to the body for improved action even with the larger hooks. 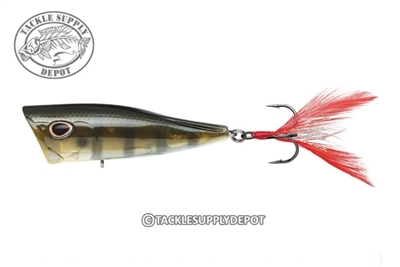 VMC Black Nickel hooks with flash feather teaser tail seal the deal.